As part of its new Analytics tool, Google recently launched a sophisticated ecommerce tracking device that allows users to analyze the interaction between Organic Marketing, Paid Search, and Social Media Marketing. With several different reporting metrics, this new tool will help marketers identify opportunities in each of their campaigns and assist in cross-channel optimization. Figure 1: Multi-Channel Funnels work by tracking the movement of a user across various online sources over a 30 day period. This movement is also referred to as “the conversion path”. These online sources can include Search Engines, Referral Sites, Paid Search, and Social Media Marketing. Using Multi-Channel funnels, it is possible to see what additional channels have assisted in the conversion. Assisted conversions refer to the number of sales and conversions directly associated with a specific channel (i.e. the number of times a channel has initiated, assisted, or completed a conversion). Figure 2: Nearly $70,000 of revenue can be directly attributed to referring domains. However it is important to note that an additional 214 conversions (nearly $26,000 of revenue) included direct involvement with at least one referring domain. These channel groupings can be broken down all the way to the specific referral source. Knowing the total conversion value (assisted conversion + last conversion) of each of your channels can help you allocate your own budget to the channels that have shown to generate the highest ROI. Top Conversion Paths outline the sources a customer used on their way to a conversion, the total number of times a different user has interacted on the same source, as well as the total conversion value of that source. Figure 3: In this example, the user performed 4 different organic searches, with their first interaction involving an organic search for “Bethesda MD hotels near NIH”. It was only after performing this non branded keyword search that the user discovered and remembered the brand name, leading to a conversion. 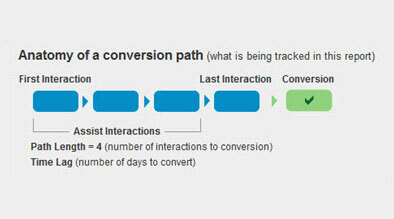 Path Length Displays the number of times a user clicked on your site (from various channels) before finally converting. Figure 4: In this example, 45% of customers entered the site more than once before converting. It is important to regularly monitor each online channel because, in our case, almost half of all conversions were due to multiple path interactions. We can help measure the ROI of our Social Media efforts by tracking conversions back to their original source within Social Media campaigns. Figure 5: Measuring Social ROI: With 3 assisted conversions, we can see that users coming from Facebook remembered the brand name and came back to the website later, and converted. For marketers, understanding cross channel optimization is integral to allocating budget across their marketing channels. While it is still in the early beta phases, Multi Channel Funnels has proven to be a highly valuable analytics tool in helping track the interaction between marketing channels online. hi david and marc – nice article. Nice to see that Google multi channel funnels is out of beta. It’s still not ideal e.g. basic reporting and only allows for a 30 day cookie prior to the sale (hence not ideal for longer sales cycles such as mortgages) however it is certainly a welcome google analytics improvement. Alternatively here is my 5 second sound bite: Now that google multi channel funnels is out of beta it will change the way, in particular, small-medium sized business track click value, it will shake up the tracking industry (e.g. the big tracking boys have got to be nervous and the affiliate marketing channel may start to move away from predominantly relying on last click attribution) and the majority of businesses should start to value the other channels that play a part in the sales funnel but are often not the last click e.g. more generic ppc clicks and social media. Thanks for checking out our article! You make some great points regarding the way companies must now track click value far beyond last click attribution. We are most excited to see how multi channel funnels allows users to more effectively track their social media campaign’s contributions to their bottom line.